So while many meals don't get repeated very often no matter how much we liked them, this is one that is a regular in the rotation. I've probably made it more than any other recipe on my blog. If it looks familiar, then you must be a long-time reader! I posted this back in the early days, but I thought it could use a little makeover. Casseroles sometimes have a bad reputation, and I can see why: they oftentimes are full of sodium-packed convenience products, soggy meat, and lots of cheese (not that that's ever a bad thing in my book though). This one however, bucks tradition. First off, it's all made in one dish - less dishes to wash - score! All of the ingredients are fresh and "real." And it comes together in under 30 minutes. The chicken is cooked perfectly, there's crunch from the tortilla chips, a hint of spice from the chipotle peppers, freshness from the tomatoes and cilantro, and of course there's still plenty of cheese. Let's not go too crazy here. Chicken is seared on both sides, then shallots, garlic, and chipotle peppers are briefly sautéed. The chicken is returned to the pan, along with chicken broth and half the tortilla chips. The chips pretty much dissolve into the broth, and the chicken stays nice and moist as it cooks. The chicken is shredded and returned to the skillet, the remainder of the chips are then mixed in along with cilantro and tomatoes, and it's topped with plenty of cheese. After a brief stint under the broiler, the cheese is melted, the top is crispy and crunchy, and you're left with one of my all-time favorite dinners. Best of all, it's open to so so many adaptations. I've added black beans and corn before in lieu of the chicken, subbed a jalapeño for the chipotle in a pinch, used some pico de gallo or fresh salsa instead of the tomatoes... really you can play around with this however you like and it will still be pretty darn tasty. *if you don't have an oven-safe skillet, just transfer to a lightly-greased 9-inch square baking dish. Add the remaining oil, shallot, garlic, chipotle, and 1/4 teaspoon of salt, and cook until fragrant, about 30 seconds. Add broth and scrape of browned bits, then bring to a simmer. Stir in half the tortilla chips. Nestle the chicken into the broth and cook over medium heat until cooked through (reading 160 on a thermometer), about 10-15 minutes. Transfer to a cutting board, and when cool enough to handle, shred or chop into bite-sized pieces. As the chicken cooks, preheat the broiler and adjust the oven rack to about 6 inches below the heating source. Sprinkle the remaining cheese on top and broil until the cheese is melted and browned, 2-3 minutes. Allow to cool about 5 minutes, then top with remaining cilantro and serve. I've been making this a long time, it's one of our favorites! It can also be doubled, although you have to transfer it to a casserole dish. Great blend of flavors! I always do the same thing to my husband, but he enjoys being the official taste-tester. :-) I love casseroles like this one that are tasty and not laden with cream of soups! Oh my word... this recipe has my name all over it! My husband would LOVE. IT. This is like my FAVORITE thing evar. In the world. And universe. I've yet to make this and I'm not sure why! It's going back in the recipe que! My husband always asks me,"Why do you ask me if I would want it again if you don't ever make repeats? :) The life of a blogger spouse! Thewaytohisheart - my husband says the same thing! This is my favorite dish to make when we have a party and the next day I find an enormous bowl of tortilla chips that went stale overnight! I've made this with several variations, including once, when I only had 2.5 cups of tortilla chips, I used brown rice in place of the other half. Very adaptable and always a crowd pleaser. I love casseroles that give casseroles a good name! haha, completely agree with you! jason is my #1 supporter and i'm sure he's totally sick of me when i ask him "is this good? really? no seriously, you can tell me the truth" ...but in all seriousness, this looks awesome, Josie!! 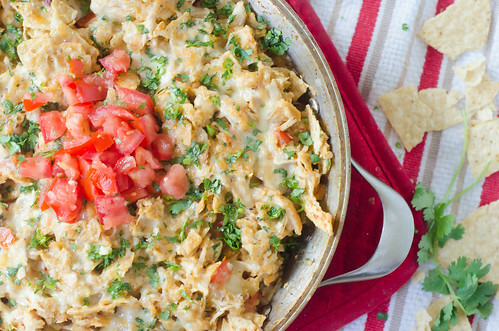 it's like a burrito thrown into a casserole, i love it! A delicious-looking casserole! I am a fan of this one :) Bring on the chipotle peppers! love that addition. Looks great! When you make this for your family is it enough or do you double? Just wondering if I should do single, 1.5, or double for 2 adults and one 2.5 year old since its from "cooking for two". Thanks for any advice! This looks great, and looks like something I could cut in half and make in my small pan when I'm on my own for dinner!